I messed up colouring the face, couldn't quite figure out where the red and white would go hehe but the rest turned out pretty good. first time drawing clothes that wherent a collar. 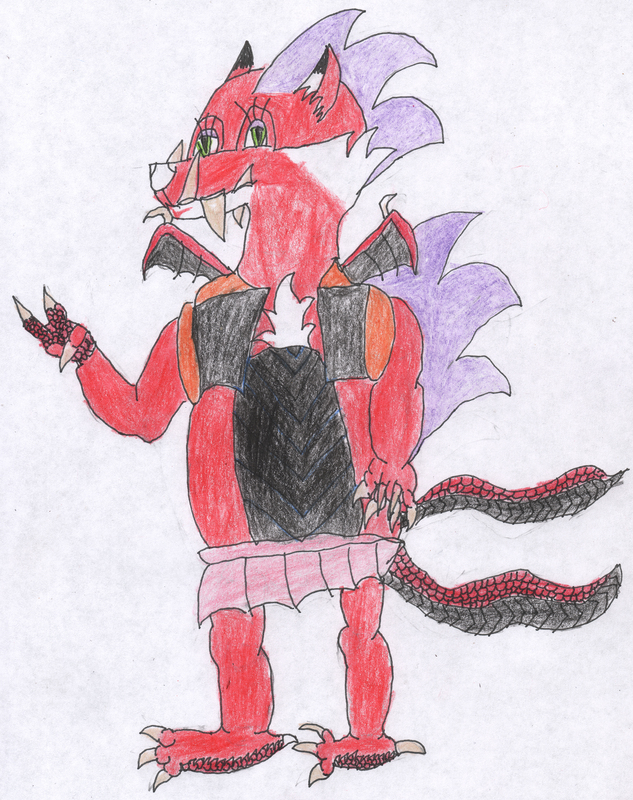 a nice vest and skirt, mostly becasue the skirt was easy to draw hehe. now you can see the basic coolours and yes she dyes her quills so she doesn;t look like sonic. she is from a univerce was imploded. she is a fusion of sonic knuckles tails and dulcy. she doesn;t have any specific memorys of the univerce, just some feeling of some pepole and things that may have happend or she may have met before but nothing exact. the vest is inspiered by gogeta fron dragon ball series. I alwasy loves the orange abd black vest so it makes me wasnt to use it on my own oc. eyes are green and quills are that lavander purple colour. the pencial didn't have the name hehe. tusks rule!